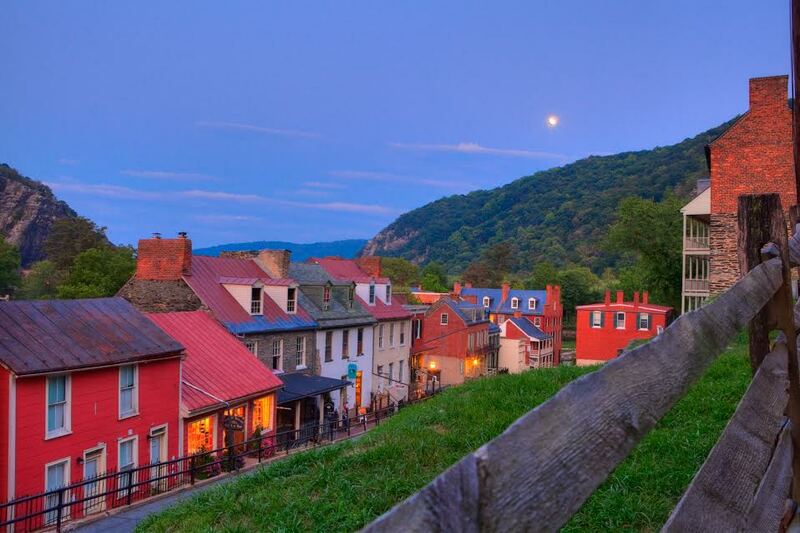 Harpers Ferry and Bolivar have been an epicenter of historic activity since their founding. Today, visitors can immerse themselves in the historic fabric of these towns and can also enjoy the many recreational and retail opportunities that make them unique. Outdoor Activities/Four National Parks in one Location! – Harpers Ferry and Bolivar sit between two converging rivers, the Potomac and the Shenandoah. This picturesque location provides a variety of land and water activities to engage in. This is also one of the few places in the country you can experience four national park areas simultaneously! On the West Virginia side, Harpers Ferry National Historical Park is one of the premier visitor attractions in that state, and well worth stopping for a visit. In addition to the history (see below), plenty of recreational opportunities await in this park. A particular favorite of hikers is the Maryland Heights trail, which stretches to a height of 1,200 feet and is 4.1 miles round-trip. The incredible view from the overlook is well worth the climb! Many hikers aspire to complete a second national park located here: the Appalachian National Scenic Trail. This legendary trail runs through Harpers Ferry and Bolivar, making it a favorite among many hikers to begin their 2,190-mile journey. Also, Harpers Ferry and Bolivar serve as the symbolic midpoint of the Appalachian Trail and this is home to the Appalachian Trail Conservancy, a popular stop for through hikers. Just across the Harpers Ferry footbridge (“Byron Bridge” to the locals), your third national park, the C&O Canal National Historical Park awaits. This 184.5-mile long National Park opens exploration to many natural and historical wonders, and provides a straight path to our other Canal Towns. Of course, the towpath is the centerpiece of the C&O Canal NHP, but after crossing the Byron Bridge, the Appalachian Trail continues south on the towpath for a mile or so before turning north. And as throughout its length, the towpath is the spine of our fourth national park, the Potomac Heritage National Scenic Trail. 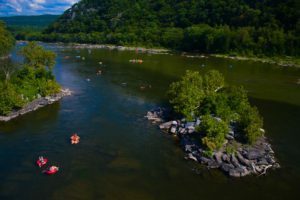 So, stand on the towpath, view Harpers Ferry and Bolivar, and consider you are in three national parks at the same time while looking at the spectacular view of the fourth in West Virginia! Events – The towns of Harpers Ferry and Bolivar play host to many events and activities for you to enjoy. The Flip Flop Festival, originally created to celebrate the hiking opportunities along the Appalachian Trail, has been expanded to include all outdoor activities. Enjoy live entertainment, vendors, kids’ activities, and a Flip Flop Thru-Hiker breakfast on April 27-28, 2019. Not even ghosts want to leave Harpers Ferry! 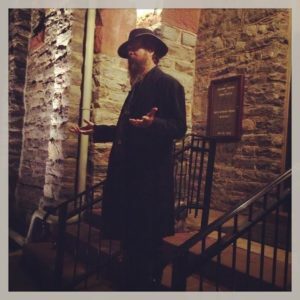 Those who aren’t afraid should try Ghost Tours of Harpers Ferry, which gives a haunting history of the town of Harpers Ferry. This thrilling experience is sure to give you goosebumps… or is that from the ghosts? History is alive and well here due to the Living History events held periodically in these towns. Watch the calendar for events taking place, such as “Defend and Protect: Arming America’s Soldiers” scheduled for May 25-26, 2019. History – Perhaps what Harpers Ferry is best known for is John Brown’s raid on the arsenal here in 1859, but this town has been subject to much more through the years. The Civil War put Harpers Ferry through the ringer. Due to its location and the fact that it was a hub of transportation, it was sought after by both Union and Confederates during the war. Being that it is surrounded by steep rises, Harpers Ferry was not a very defensible position. This led to Harpers Ferry changing hands between Union and Confederate occupation a staggering fourteen times between 1861 and 1865! Some very famous individuals have passed through Harpers Ferry and Bolivar on their journeys. A 17-year-old George Washington visited the area on his first surveying expedition, while Meriwether Lewis of the famous Lewis and Clark acquired weapons for their adventure westward. Shopping – There are many charming shops located in Harpers Ferry and Bolivar just waiting to be explored. The Gilded Flea is a shop as unique as it gets. This store houses antiques as well as one-of-a-kind handmade creations. There is so much to discover at this store that you just have to stop by and experience it for yourself. A true taste bud time machine, True Treats Historic Candy offers treats from time periods as far back as the 1500’s. Here you can buy sweets that were enjoyed by the Native Americans or find a favorite candy from your childhood! 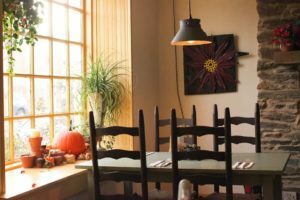 Dining – There are so many restaurants found in these towns that the options can seem overwhelming. Each of these restaurants hosts a unique atmosphere and great food. Here are just a few places to visit during your trip. Bisou Bistro is unlike any other nearby restaurant. What separates this establishment from the rest is its unique menu featuring Cajun and French Creole dishes. Though located in West Virginia, Bisou Bistro gives you a taste of Louisiana. Beautiful dining area at Bisou Bistro. Potomac Grille houses some great food options and is the perfect place to sit outside and enjoy a beautiful day. The outdoor deck overlooks the Harpers Ferry Train Station and some of the surrounding mountains, providing you with dinner and a view. The Town’s Inn features the newly renovated restaurant Bistro 1840 and a Mountain House Cafe and Shoppe featuring “grab & go” cuisine. If you need a place to lay your head for a night, the Inn also has quaint rooms available. Though Harpers Ferry is notorious for its many conflicts, Scoops Ice Cream shows the town’s sweeter side. This ice cream shop serves a variety of much-loved ice cream flavors, as well as some homemade ice cream treats for you to enjoy. Harpers Ferry and Bolivar are waiting, so if you have not included these two Canal Towns in your “must-visit list”, it may be time for a revision. Learn more about Harpers Ferry and Bolivar at http://www.historicharpersferry.com/main.